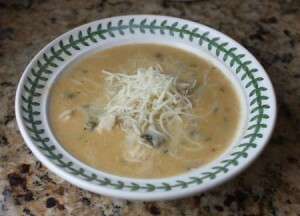 Turkey Poblano Soup is a great way to use leftover turkey from Thanksgiving. Wash the poblano and remove stems and seeds. Broil about 5 inches from heat or until blistered and soft. Quickly put in a zipper bag then seal and let cool. Remove from bag, peel of the skin and chop to make ½ cup. Combine chopped tortillas, flour, chili powder, cumin, 1/8 teaspoon salt, and pepper in bowl of a food processor and process until mixture is the consistency of very coarse cornmeal. Set aside. Saute onion and the 1/2 cup poblano in a large pot until onions are tender. Add garlic and sauté for another minute. Add butter and let it melt. Add tortilla-flour mixture to the pot and mix to form a roux. Slowly add the broth (about 1 cup at a time), stirring to make a thick soup. Cook 4-5 minutes stirring constantly. At this point, taste and adjust salt if necessary. Add half and half (or milk & cream) and bring to a slow simmer. Cook over low heat until soup is hot. Do not let it boil. Remove from heat and add the turkey. Spoon into bowls and top each serving with cheese. I didn’t put the exact amount of salt because this varies with the broth. If you use low sodium broth, you may need up to ½ teaspoon. If your broth is salted, you’ll only need a pinch. Start with 1/8 teaspoon and adjust salt as necessary.